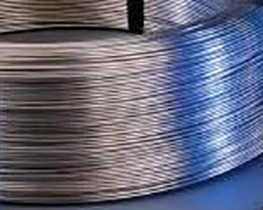 Please see our Aluminum Metallizing Wires Comparison Chart for available aluminum metallizing alloys. Notes: (a) Single values shown are maximum percentages unless a minimum is specified. (c) Others: 0.05 max each, 0.15 max total. (d) Vol% Aluminum Assn. 1060 Alloy (99.6% pure Al) with addition of 8-12 Vol % Al2O3 powder, 8-10 micron diameter. Aufhauser will custom manufacture with any registered aluminum alloy. However, specific alloy availability and shipping lead times will be determined on a case by case basis. Any custom size is available between 0.057 and 3/16 inch.